What if this year we changed our plans? 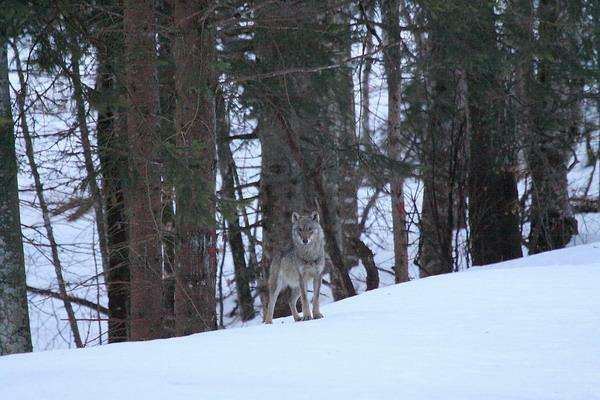 Instead of going to track Lynx in the Jura Mountains, why not try to find traces of evidence of Wolves in the Vercors? So, then I left at the end of March 2009 for a four-day adventure in the Vercors, an area I had not visited before, with my friends joining me for the last two days of my stay. Arriving at the Auberge du Pionnier, owned by Rémy Pozzi (naturalist guide and photographer), I was immediately charmed by the wilderness of this place, at the edge of a forest and steep cliff, miles away from any other houses. I spent the two first days alone, exploring different areas, trying to find interesting clues and hiding out at the edge of the forest. The results were already promising, since prints of a large lone canid were spotted on a snowy track and numerous observations and photos taken of local wildlife (red deer, roe deer, foxes and so on). We looked for an alignment in the trees, which would allow us to observe the deer’s carcass some 80 metres away, with the wind in our face. We quickly gathered a lot of dead branches, so as to conceal ourselves the best way we could. Fortunately, we made the discovery at the beginning of the afternoon, so we had time to go quickly back to the hostel to equip ourselves to be as warm as possible (I put on six layers...!). Then two hours later, we returned to the hide out, not without having largely bypassed the deer to ensure we left no smell near it. Soon we reach the end on the day, and daylight gradually diminishes. Fortunately the sky was clear, and the snow allows some visibility to be maintained in the undergrowth. Suddenly a movement ... In our binoculars appeared one, then two, then three large figures from amongst the trees, standing out clearly against the snow ... Wolves! They are here! We see their silhouettes turning towards the deer, moving with stealth through the trees and gradually approaching their meal. That’s it, they are at the carcass! 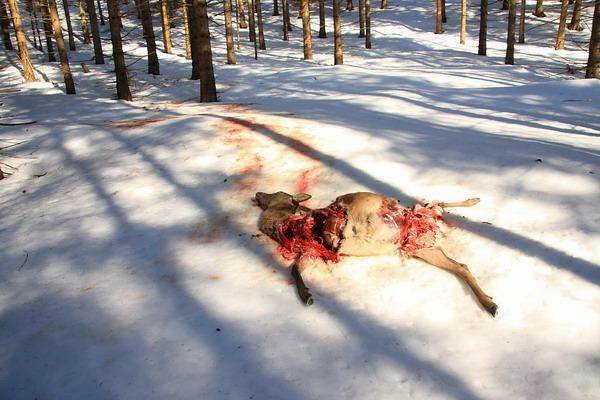 Quickly enough they take the deer a few feet away and put it out of our sight, but we hear distinctly in the night the unceremoniously shredding of bones. We decide then to leave as discreetly as possible, making a wide detour through the forest to try and not disturb them. We remain silent during our walk until we arrive at the track again several hundred meters away, and then, being sure we are far enough away we finally express our emotions in hushed voices... What incredible luck we have had, to observe wild wolves in France! On March 20 at dawn.. I watch the track, and my friends are watching the remains of the deer which are about sixty metres away. The sun is rising, and I prepared my camera with a monopod firmly fixed on the roots of the tree. We do not believe we have much chance today, but after all, what do we risk? After 10 minutes, a movement on the edge of the track at about 70 metres away attracted my attention ... 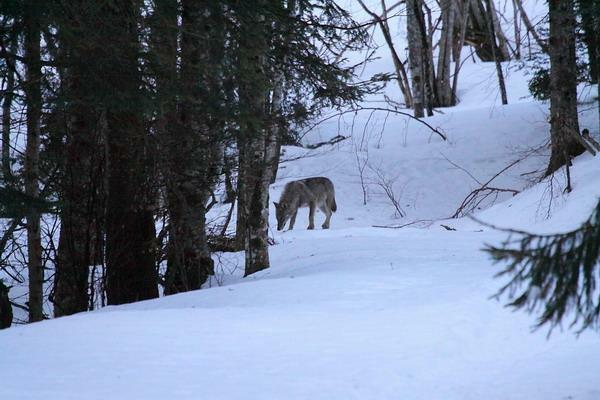 Immediately a wolf appears, and slowly crosses the trail, sniffing for scents... I manage to take 3 or 4 photos during this brief passage. The cameras’ noise alerts Anne and Bruno who did not see anything and look at me, questioning. I whisper to them, with great excitement - a wolf...!! Meanwhile, the wolf goes down into a small hollow in which he can be seen in the distance, sneaking through the trees, heading toward the remains of the deer. I reinstall my camera at a different angle behind my tree, to find an alignment that allows me to see some of the prey, convinced that the wolf is going directly there. But he hesitates and turns, and finally heads back to the edge of the track a little closer to us ... I have to change position as gently as possible and redirect my camera. The wolf is going to appear, I know he is coming, and then, there he is, he stops at the edge of the track, perfectly clear, 50 metres from us! Finally I manage to find support and trigger 3 times. 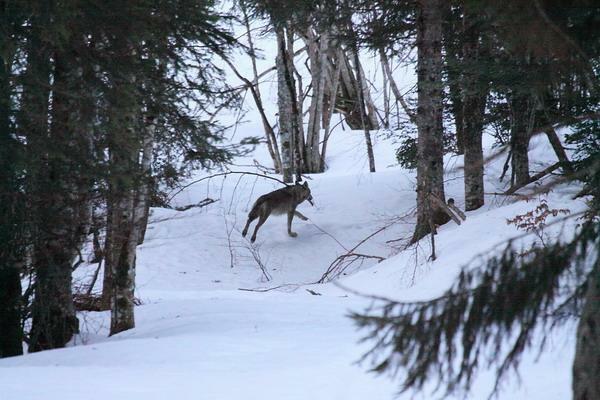 The wolf is alerted, and after a few seconds he turns around and runs away. What an emotion, what an encounter, what an observation, that added to those of the night before! With the pictures as a bonus, even if they are not of the highest quality, they will leave a beautiful testimony of these exceptional and unforgettable encounters!